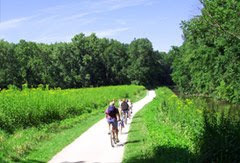 Century Cycles Blog: Come rent a bike for a ride on the Towpath Trail! Looking to take a casual ride in the Cuyahoga Valley National Park? Got friends and relatives visiting, and looking for something to do while spending a day out? Century Cycles has bicycles for rent at our store located in Peninsula, Ohio. You can ride right from the store onto the Ohio & Erie Canal Towpath Trail, which is very flat and suitable for all ages and skill levels. We rent Raleigh comfort hybrid bikes and Electra Townie cruisers that fit most adults and young adults, Raleigh Mountain Scout bicycles for kids, and trailers and tag-alongs for small children. We're open 7 days a week, and just a 30-minute drive from Cleveland or Akron! See our newly-updated bicycle rental information page for full details on rates, hours, directions, our bicycles, and everything you need to know to enjoy a fun ride!